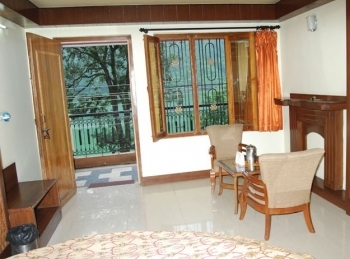 Hotel Gurdeep is deluxe hotel located on the main Mall Road in Nainital. The hotel offers panoramic views of Nainital Lake from the room windows making it ideal for honeymoon stay also. It is at a walking distance from all the significant places, such as Naina Devi Temple, Boat House Club, Bus Stand etc. The hotel is centrally located on Mall Road in Nainital. Other sightseeing locations in Nainital are Naina Peak (6 kms), Lands End (6 kms), Water fall (10 kms), Raj Bhawan (3 kms), Dortothy seat (4 kms), Hanumangarhi (3 kms), Snow view (2.5 kms), High altitude Zoo (300 mt), Cave Gardens (4 kms), Observatory (12 kms) and Kilbury (16 kms). The hotel has an array of 14 well-appointed rooms enriched with classic wooden flooring and well finished walls. The rooms come with all basic amenities like attached bathrooms, running water, television, intercom connection, purified water system, provision for hot water, room services, parking facility (conditions apply) have not been neglected. The hotel offers in-room dining facility to its guests with sumptuous breakfast, lunch and dinner. - Children till the age of 8 years treated free. 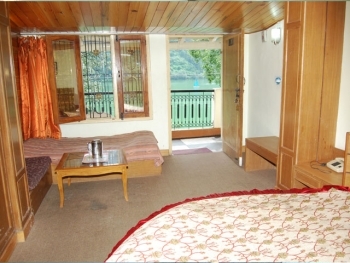 The hotel is situated at main Mall road in Nainital. The lake city is well connected by road and bus, taxis are easily available from Kathgodam and Delhi. Delhi is at 7 hrs driving distance from Nainital. Kathgodam railway station is at 40kms from the hotel. Nearest airport is at Pantnagar and Delhi.